Just assembled the forks for the 1972 GT550 cafe build. Used new fork inner tubes & assembled them the same way it was when I took it apart. But the shuttle valve & piston can be installed two ways. Ans there is no guarantee that it was correct when I took it apart. The shop manual provides no insight. Anyone know what the correct orientation is? I’m asking about the orientation of parts # 10 & 12. Part #10 is fixed in position by parts # 13 & 15. Part # 12 slides back & forth to cover or expose the oil flow holes in the inner tube. With the parts assembled as shown, part #12 can barely move. With part # 10 flipped, part #12 can travel much further. But its easier to assemble as shown in the pic. There isn’t much oil volume in the gap between the inner tube & outer tube. Those oil flow holes restrict the flow into, & out of, that gap. So maybe part #12 only needs to barely move to control the damping. The flow area for those little holes is rather modest. A very small gap between parts # 10 & 12 is needed for the gap flow area to exceed that hole flow area. So I think it all makes sense now & what I have is correctly assembled. I don't have a set of forks apart, but IIRC, the piston part 10 can only fit one way over the steel ring clip that stops upward movement. The bottom side has a slight chamfer or radius I think. 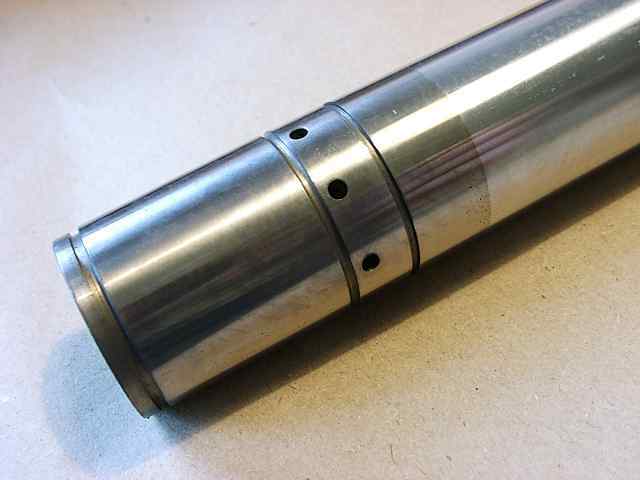 Part 12 is the shuttle valve and it moves up as the fork compresses and lets oil flow quite easily. As the forks extend, it moves down the leg and restricts oil flow ie it adds damping. It's the same sort of design as was used on CB72/160 etc Hondas in the sixties. I am sure that the lower side of the piston has an internal chamfer that allows the oil flow and the upper side is plain where it butts up against the flat retaining ring. Part 10 was easy to figure out. If you put part 15 on before part 10, then there is only one way you can install parts 10 & 13. Part 12 doesn’t slide up and down very much. The maximum flow area through the small gap between parts 10 & 12 isn’t very big. That had me confused until I realized that not much of a gap is needed for that flow area to exceed the flow area of the small holes. Lesson learned. I didn’t document how the parts were arranged when we took the forks apart. Am waiting on my mechanic/friend to finish the motor & for Jemco to ship the exhaust. Custom wiring will take some time too. With a bit of luck the motor will be running around the end of next month.